Carnival is the world-renowned event of popular Brazilian culture. The parade — although that is simplifying the importance and scale of the festival — is so intrinsic to Brazilians that they divide a year into two parts: before and after Carnival. It takes place shortly after New Year’s, either in January or February, and is the event everyone looks forward to. The largest and most popular Carnival festival would be that of Rio de Janeiro, with the festivals taking place in Salvador and Pernambuco following closely behind. Originally beginning as a food festival, Brazilian Carnival is unique in that it is the culmination of the culture clash between the Portuguese (who brought the festival from Europe) and the Africans (who shared their rhythms, music and dance). Gradually the tradition evolved into a once-a-year opportunity for everyone, regardless of social status or wealth, to party together in the streets. Carnival encompasses the concept of ‘pretending’; social conventions are abandoned and it is the one time of the year where one can legitimately ‘let go’ and just enjoy yourself. Dancing, parades, great food, and music combined with colourful and explosive scenes; it is the perfect opportunity to kick back, have fun and immerse yourself in Brazilian culture. There are three major components to Carnival. The official Samba parade, the street parades and finally, the Masquerade Carnival balls. The Samba parade for Carnival Rio will be held at the Sambódromo stadium in Santo Cristo. The twelve top samba schools of Rio de Janeiro will be competing, with each group consisting of about 4,000 participants. Ticket prices range anywhere from US$60 to US$1,000, depending on the day and the sector. If tickets are too pricey, or it just isn’t the right time of year, never fear, samba schools start preparations for next year’s carnival immediately after the actual parade. The largest schools have their own hangar in Cidade do Samba (Samba City) and their rehearsals are usually open to the public, so you can still get a taste of Carnival at any time of the year. 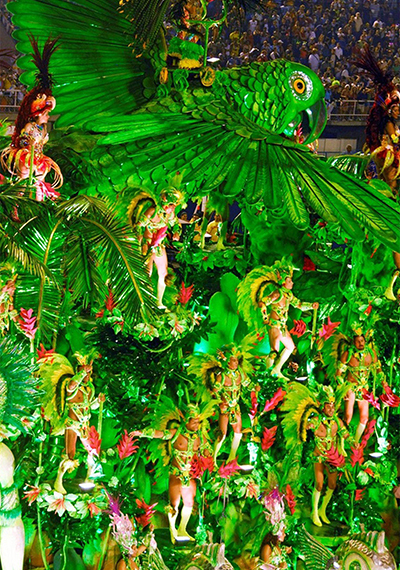 If you really want the ultimate Rio Carnival experience, many samba schools welcome foreign volunteers. Contact any of the schools for details, make sure you’re in Rio at least a week before Carnival for rehearsals and invest in a good costume, then revel in the high of over 90,000 fans cheering you on as you dance the night away. A more informal and probably accessible way to experience Carnival, however, is to join the blocos at various street parades that take place as early as November. Blocos are themed dance/music groups, which make their way through neighbourhoods with crowds singing, dancing and drinking along with them. Try to get informed on which ones are relatively safe (stick to Southern Zone or Centro), and if you like beach parties, the blocos in Copacabana and Ipanema are the ones to look out for! Finally, if you prefer celebrating indoors, or you’re just looking for less of a wild night, Carnival balls are a slightly tamer option. These costumed parties are usually indoors, relatively upscale and held just as frequently as the blocos during Carnival week. The most famous and formal ball is the Magic Ball at Copacabana Palace. Otherwise, more affordable balls are organized every night of Carnival week. Generally tickets go on sale about two weeks in advance, so make sure you check out the schedules for venues, rates and dress codes on the official Rio Carnival website.